Cut oxtail into small chunks and add to a large pot with beef bone and boiling meat. Fill up with water and bring to a boil. Let simmer over medium heat and skim foam from time to time. Peel shallots and add to a frying pan with ginger. Fry until they start to turn very dark brown, then add to the pot. Let the broth simmer over medium-low heat for approx. 2 hrs. Discard beef bone, oxtail, ginger and shallots. Remove boiled beef and transfer to a bowl with cold water. Add cardamom pod, fennel seeds, cinnamon stick an star anise to a frying pan and fry until fragrant. Add to the pot. Season the broth with fish sauce, salt, and sugar. Let simmer for approx. 30 min. Cook rice noodles according to package instructions, then drain. Finely slice scallions and chilis. Slice boiled beef and raw beef tenderloin. Remove cardamom pod, fennel seeds, cinnamon stick an star anise and bring broth back to a simmer. 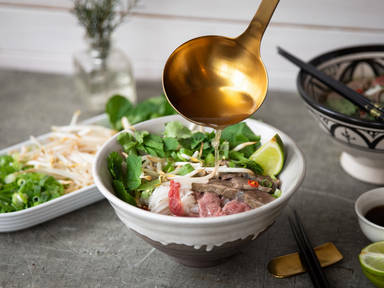 Add cooked rice noodles, raw, and cooked beef to a serving bowl and ladle hot broth into the bowl. Top with soy sprouts, scallions, mint, cilantro, and chilis. Serve with more chilis, fish sauce and lime juice for everybody to season to taste. Enjoy!